Four of the wounded were police officers who responded to the scene. The victims have not been identified, but officials say that no children were hurt or killed. 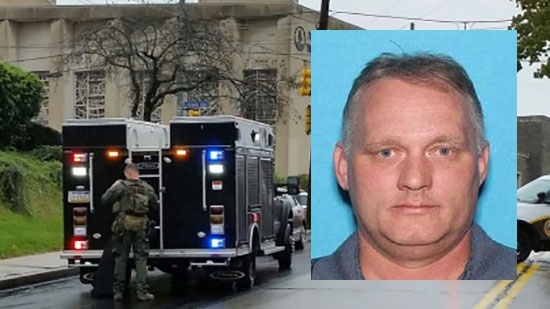 The suspect has been identified as 48-year-old Robert Bowers. He was shot several times by police and is in custody at the hospital in fair condition. Authorities found an AR-15 and three handguns. UPDATE: The fatal victims have been identified. The building was full for Saturday Shabbat services in several rooms. There may also have been a baby naming service - brit milah (bris) - occuring. The Squirrel Hill neighborhood is widely known as one of the country's strong Jewish communities. Around 1,000 people attended a candlelight vigil near the synagogue on Saturday evening. Bowers used a social media site similar to Twitter called Gab (based in Philadelphia) to post anti-Semitic hate messages. He also posted anti-Trump messages, saying he didn't vote for the President. United States Attorney General Jeff Sessions said that the Justice Department will be filing federal hate crime and other charges against Bowers. The U.S. Attorney for the Western District of Pennsylvania announced charges tonight. Those charges include 11 counts of Obstruction of Exercise of Religious Beliefs Resulting in Death, 11 counts of Use of a Firearm to Commit Murder During and in Relation to a Crime of Violence, 4 counts of Obstruction of Exercise of Religious Beliefs Resulting in Bodily Injury to a Public Safety Officer, and 3 counts of Use and Discharge of a Firearm During and in Relation to a Crime of Violence. Those charges could lead to the death penalty. In Philadelphia, police will increase their presence at synagogues and other houses of worship. Hundreds gathered on Saturday evening for a vigil in Rittenhouse Square. As we continue to monitor the situation in Pittsburgh, we are sending officers to Synagogues and other houses of worship across the city. We are not aware of any current threats to Philadelphia - but as always - encourage folks to dial 911 with any suspicious information.